Did you know? There is now a Farmer’s Market at the Kings’ Shops at Waikoloa Beach Resort, every Wednesday from 8:30 to 1pm! And of course there are the usual Saturday morning markets throughout the Big Island, with several mid-week markets as well. Waimea recently opened a new Wednesday Market at Anna’s Ranch, and the Kailua Village Market in downtown Kona is open Wed thru Sun from 9 til noon! One of the nice things about renting a condo rather than a hotel room is that you can bring those fresh and delicious treasures into your own kitchen and wow your friends and family with the delights of island fare. Here are a few special items, not to be missed at the local markets. Apple Bananas! 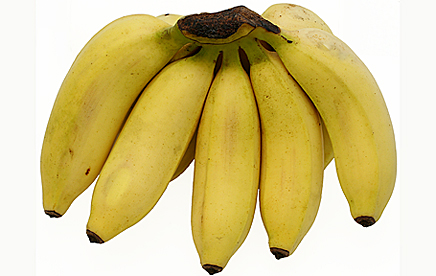 Although short in length, apple bananas are fatter and chunkier than other small varieties and their flavor, once ripe, is both tangy and sweet displaying hints of apple or strawberry. Wait till the peel is dark, and you will experience the best flavor and highest sugar content These bananas are DELICIOUS stuffed with walnuts or peanut butter for a quick, hearty and nutritious snack. Sweet, Juicy – buy a LOT! 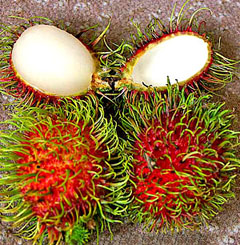 Not to be missed is Rambutan! They look funny, but they are delicious, and quite the treat for anyone with a sweet tooth. Buy a bunch! You’ll be glad you did…and they look so pretty in the fruit dish. To eat them, simply peel the thick hairy skin off and pluck the sweet juicy fruit out. They do have a sizeable seed, so chew gingerly, and be sure you buy enough, because they are quite tasty, and you can never seem to get enough. Mild and sweet, they are a fun fruit to pile high on the table while the family gathers round. Dress up your table with dragon fruit! Dragon fruit is another exotic treat, worth a try. With it’s light sweet taste, intense shape and color, it is sure to be a hit with anyone willing to try something new. Highly decorative, it is also tasy, so pick one up for a new experience with an exotic Island fruit. 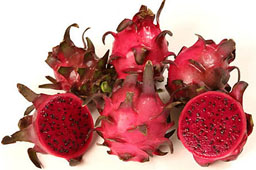 Dragon fruit is especially popular in a fruit salad, or used as a garnish to make any dish look festive. 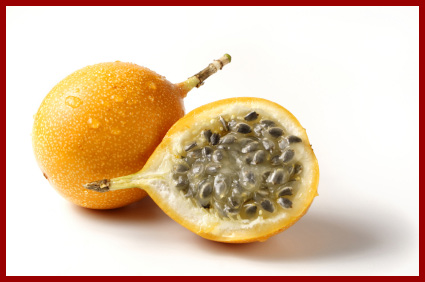 An island staple – lilikoi or passion fruit. Lilikoi, or Passion Fruit is an island “staple” for flavoring everything from jam to juice. At once sweet and tart, the juice/pulp and seed are edible, but the fruit must be mature, as toxins exist in the immature fruits. While the seeds are edible, it is the fruit and juice that are mostly used. The pulp is normally pressed through a strainer and then bottled as a concentrate. We normally use it in combination with water or other juices, along with fine crushed ice and vodka to make a delicious frozen cocktail. In our opinion, Kilauea Lodge in Volcano makes the world’s best Liliko’i Margarita. Of course, pineapple, papaya and mango are also favorites to purchase at the Farmer’s Market. Look for “white pineapple” which are highly concentrated sweetness. The only safe place to eat a mango is in the bathtub, but it’s well worth the sweet juicy pleasure. Not only do we have wonderful fruits, vegetables, breads, coffees, crafts, and all the other normal fare of a farmer’s market, but often you will find a tasty breakfast, and some happy music as well. Farmer’s market is a cultural tradition wherever you go, and especially on the Big Island, it is a solid way of socializing and meeting old friends and new. Come along! The locals always welcome visitors, and are happy to share their wares with you. This entry was posted in Big Island Activities, Farmer's Markets and tagged Farmer's Markets, Island fruits. Bookmark the permalink.